Below are suede chaps for sale in different weights and colors. 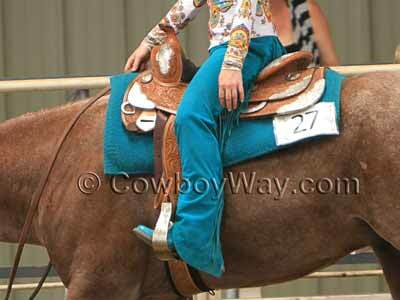 Suede chaps are usually used for showing horses instead of as a work chap. Please scroll down for the difference between suede chaps and ultra-suede chaps. Below: A pair of light turquoise-colored suede chaps. Suede is leather that has had the surface specially manufactured to create a nap instead of a smooth finish. Suede chaps are usually used for showing instead of being used has a working chap because suede does not stand up to dirt, manure, etc. as well as regular leather. Suede chaps are often very attractive and soft, and frequently have long, beautiful fringe. Ultra-suede (sometimes also spelled ultrasuede, ultra suede, etc.) is not made of leather. Instead, it is a man-made, non-woven material made of micro fibers. Many items made from Ultra-suede can be machine washed or dry cleaned. However, you should always follow the manufacture's directions for cleaning. It's also important to know that if ultra-suede chaps (or other items) have buckles, conchos, or fringe, it may mean the item cannot be machine washed.